Pros: Great customer support, varied plans, money back guarantee. Cons: Not extremely reliable, limited features, limited pricing periods. Bottomline: A web host with promise, with somewhat fairly priced plans, brought down with initial issues and limited features. 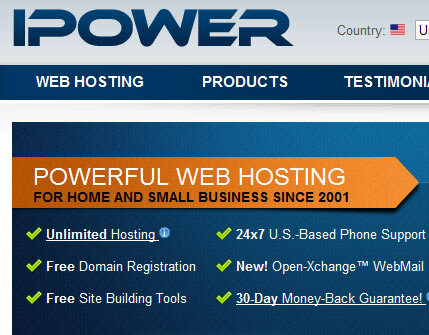 IPOWER are a US based web host similar to that of iPage and FatCow. You may have noticed these similarities, and this is because they are all owned, along with several others, by the Endurance International Group (EIG). IPOWER was founded three years later than iPage however. Let’s go ahead and scope out the details and see if iPower along with the rest of its sibling hosts contain mostly similarities or are quite different than one another in aspects including reliability, speed and script performance. IPOWER does not allow you to pay monthly, quarterly or biannually. You are given two pricing periods: yearly, or biennially. This is certainly inefficient as you have to pay a large sum at the beginning of the period and can’t really take out a ‘trial period’ with the host. The Starter Plan contains 5GBs of disk space and 250GBs worth of bandwidth. This is definitely more than enough for any starter website. You are not offered a free domain with this plan, and if you wish to buy one from them, it’ll cost $13.99 per year. You are also limited to using one domain, and are only given one MySQL database and e-mail account. This is extremely low and they should really offer more of these resources with this plan as it is definitely not adequate. The account also has limited e-commerce features offered. With this plan, you also have to pay a $10 setup fee. The Pro Plan offers unlimited disk space and bandwidth. You are also given a free domain name for the lifetime of the account. You are allowed to use unlimited domains in conjunction with the account. You are only given 25 databases though, and for a ‘pro plan’, I was honestly expecting a much larger number. These days, hosts offer up databases in the thousands, and most of the time, unlimited. I am unsure why iPower reserves such a low number of databases for a higher priced plan. The amount of e-mail accounts has significantly improved however as it jumps from one to 25,000. Unlike the starter plan, you are given access to e-commerce features and varied scripting functions and platforms. The Pro Plus plan is somewhat similar to the Pro plan, by offering you unlimited disk space and bandwidth, however they offer three free domains for the lifetime of the account. This is something I have never seen before, as most hosts just offer one free domain in the highest price account. This is definitely a great offering from IPOWER. Yet, they are brought right back down as this plan only offers 25 MySQL databases; the exact amount from the Pro plan. I would’ve thought they would offer at least double that of the plan below, but to my surprise, I was incorrect. It seems almost not worth it to shell out and extra 5 dollars a month for a limited amount of databases. Aside from this, you are given unlimited e-mail accounts, as well as a premium website builder, and various premium scripts such as ShopSite (a premium website builder). In my personal opinion, the Pro plan seems like the best one to go for. The starter plan is simply not adequate due to its lack of resources, and the Pro plan pretty much just hits the mark. The Pro Plus plan is essentially not worth it as all you’re getting is a couple extra domains and e-mail accounts. I’d say stick to the Pro plan and keep it safe and save yourself a little money. iPower also offer a 30 day money back guarantee where you will be refunded in full for whatever pricing period you have chosen. Unfortunately, IPOWER do not offer any sort of up-time guarantee, so it’s a guessing game from here on out. The iPower terms of service page is somewhat identical to that of iPage’s. The only difference really is the change of name. It is broken down into links, with several policies and acts. The user agreement link is a long article full of legal jargon, which is what you’d expect; however the policies outlined within it are very standard. The unlimited usage policy states that if any user exceeds whatever IPOWER deem as the strict usage limit, their hosting account will be suspended or deleted without warning and the user should understand, and have knowledge in the fact what could be considered using too much resources and ultimately causing problems for others on the server. The other policies include SEO agreements, anti-spam and domain name and copyright disputes. Testing IPOWER was a new experience for me. Why? I never actually got to test the services thoroughly due to a nameserver issue. I bet you’re asking: “Why are you posting this if you can’t complete the testing process of the review?” The reason is because this gives a whole new take on the reviewing process. The interesting fact is; these things happen. Customers have to deal with complicated issues that don’t normally occur often. Let me elaborate a little more on the situation. At the beginning of every hosting review, I start the monitoring process. This means for a specific time frame (let’s say a week), the uptime and downtime is monitored. Initially, I change the nameservers to the web host I am reviewing and leave it to monitor for one week. At the end of the week, I’ll have a specific frame of time where the monitoring tool I use (thanks to pingdom for providing us this tool) gives me a detailed report. The issue with IPOWER was the nameservers did not propagate properly. This resulted in a monitoring report that had nothing but downtime. It was a meaningless report. I contacted IPOWER about the situation (the transcript can be seen below in the Customer Support section) and they suggested I contact my registrar as it wasn’t really an issue of theirs. I proceeded to contact my registrar, they did not understand the problem and suggested it was a problem with my web host. It seemed like a back-and-forth blame situation was happening here. I still do not understand why the nameserver propagation did not work, but after resetting the nameservers multiple times, it finally worked! However, this was at the end of the monitoring period and I couldn’t test the service thoroughly. Luckily for you, the reader, IPOWER is a sibling to iPage, Fatcow and many others. IPOWER is pretty much identical to iPage; the control panel, welcome e-mails, script installation are all identical. EIG own these web hosts so it seems they must utilize a lot of the same software for some of the web hosts they own. This isn’t exactly original or good business practice but it sure is a good situation for this review. Feel free to read the iPage review to get a peace of mind on how iPower operate. Stewart Davis: Hi, how are you today? Smair: Hi there, fine, and you? Stewart Davis: I’m great, thank you. How can I help you today? Smair: I’m having a DNS issue. I set-up my nameservers around 6 days ago, and I still cannot access my website. I use namecheap, and set my nameservers to ns1/ns2.ipower.com. Stewart Davis: Could you please provide me with the domain name? Stewart Davis: Could you please provide me with your account username? Stewart Davis: I have added the domain name to account. Smair: Would you be able to tell me why it wasn’t working initially? Smair: Okay, will do. Thanks. Stewart Davis: Is there anything else I can assist you with today? Smair: No thank you, have a nice day! Stewart Davis: Thank you for chatting with us. Please feel free to contact us at any time. We are available 24×7. Stewart Davis: Take care, and have a nice day! IPOWER had extremely fast support responses. I was connected in under 30 seconds and I received a response shortly thereafter. The representative was very friendly and answered my questions thoroughly whilst providing additional information. I felt very welcomed and the responses were much better than I had originally expected. This was definitely a nice surprise. IPOWER are a US web host owned by EIG; a sibling to those such as FatCow, iPage, JustHost and many more popular hosting companies out there. They offer varied plans at a somewhat fair price, however some features are extremely limited, such as databases. They only allow two pricing periods, therefore it is a long-term commitment signing up, so you better make sure you are 100% convinced before signing up. The customer support service was very friendly and informative also. Due to initial issues, the reliability of the host is brought down as the issue was extremely abnormal. If the host could have avoided this issue, and had impeccable uptime (I guess we’ll never know), they would most likely be a 4 star host. They have too many limitations for me. I am constantly changing up my plan as I add or sell my websites. I need a hosting plan that allows me to do that without any hassles.